This confirms it!. 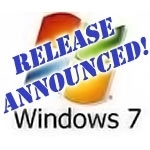 It’s time to jump the Vista ship and get on board with Windows 7. No need to cling to that precious version of Windows XP either. Skip vista and hop into the latest and greatest. You know you want to.